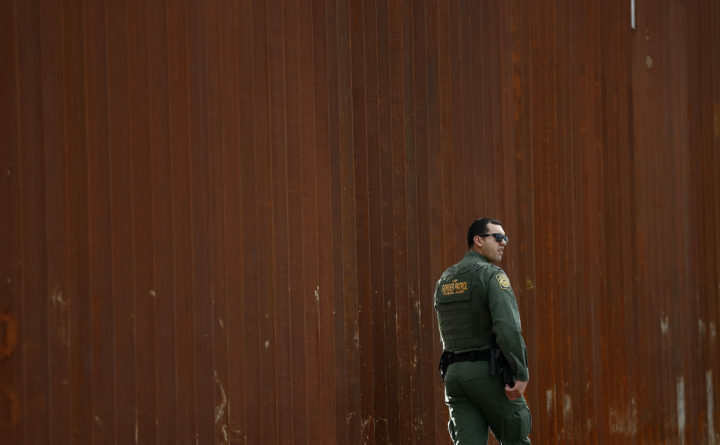 A U.S. Border Patrol agent looks on in front of a section of newly-replaced border wall in San Diego, Jan. 15, 2019. WASHINGTON — As negotiations over a border security hit a snag, the White House on Sunday would not rule out another federal government shutdown even as it signaled a willingness to obtain funding for President Donald Trump’s proposed wall by other means. A congressional deal seemed to stall even after Mulvaney convened a bipartisan group of lawmakers at Camp David on Friday. While the two sides seemed close to clinching a deal late last week, significant gaps remained and momentum appears to have slowed. But Mulvaney did signal that the White House would prefer not to have a repeat of the last shutdown, which stretched more than a month, left more than 800,000 government workers without paychecks, forced a postponement of the State of the Union address and sent Trump’s poll numbers tumbling. The president’s supporters have suggested there are executive powers that Trump could use to divert money from the federal budget for wall construction, though it was unclear if they would face challenges in Congress or the courts. One provision of the law lets the Defense Department provide support for counterdrug activities. But declaring a national emergency remained an option, Mulvaney said, even though many in the administration have cooled on the prospect. A number of powerful Republicans, including Senate Majority Leader Mitch McConnell, R-Kentucky, have also warned against the move, believing it usurps power from Congress and could set a precedent for a future Democratic president to declare an emergency for a liberal political cause. As most budget disputes go, differences over hundreds of millions of dollars are usually imperceptible and easily solved. But this battle more than most is driven by political symbolism — whether Trump will be able to claim he delivered on his long-running pledge to “build the wall” or newly empowered congressional Democrats’ ability to thwart him. In a battle that’s also largely over semantics, Democrats have said they won’t pay for a “wall.” But they are open to financing other types of barriers, such as vertical steel slats called bollards, barriers atop levies and vehicle barriers.